Actilino is the super-compact note taker for blind users. 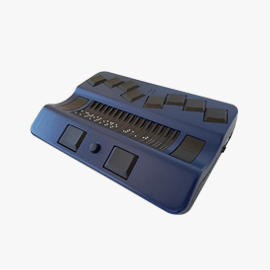 16 piezo ceramic Braille cells and the silent Braille keyboard make the Actilino your reliable every-day companion. 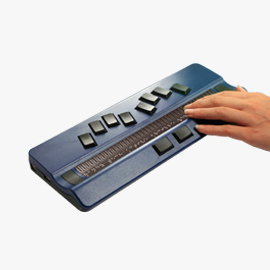 In real time, Actilino displays information in Braille for tactile reading. Additionally, you get the speech output of the connected computer. With Actilino Braille readers get access to the world. You don’t need to install software: Simply type your notes with Actilino and send it to your smartphone or PC. The built-in microphone of the Actilino allows you to make calls with such programs as Skype, FaceTime, and WhatsApp. Actilino provides unique touch recognition. 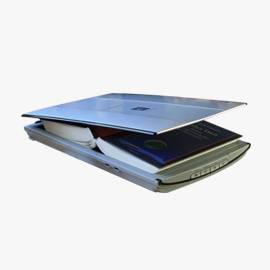 Handy Tech’s patented ATC (active tactile control) technology allows using the device like the touchscreen of a tablet. ATC offers continuous reading. When reaching the end of the displayed text, it scrolls automatically to the next text position. At work, school, home or on the go – Actilino is always at your side. Actilino is a complete note taking device. It provides a wide range of functions, like the easy-to-use editor, calculator, scheduler, timer or alarm clock. 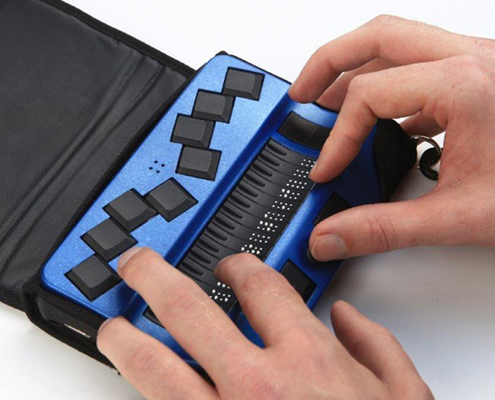 Actilino even includes interactive games and support for MusikBraille literacy. Just switch on the Actilino and start writing. Without the need of additional software send your notes to your smartphone or PC with a simple key command. Actilino has something for everyone. Whether you are just learning to read Braille or you are an avid reader. Enjoy reading a book cover to cover without ever pushing a button. Actilino’s memory card (micro SD) can hold literately thousands of books. You will never run out of reading material. The touch control technology of Actilino makes reading a pleasure. 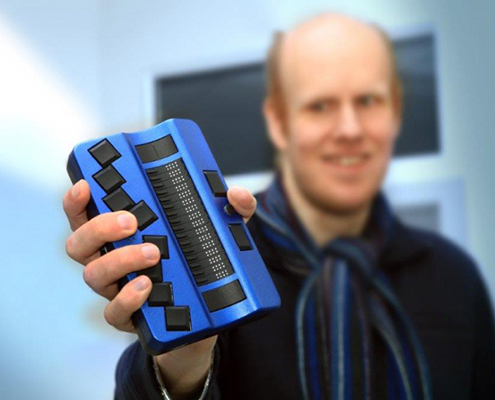 The ATC-technology detects your reading position on the Braille display in real time. 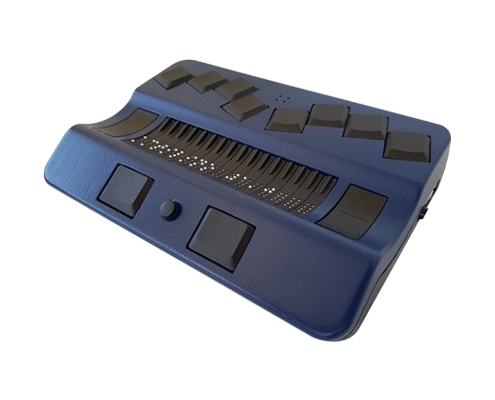 The sensitiveity of the ATC is adjustable, so it is ideal for Braille readers at all levels. 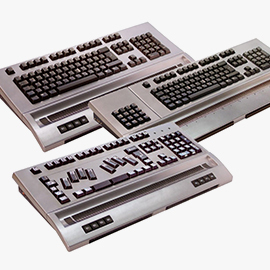 Actilino offers it all: Braille output, speech output, text input and PC control. 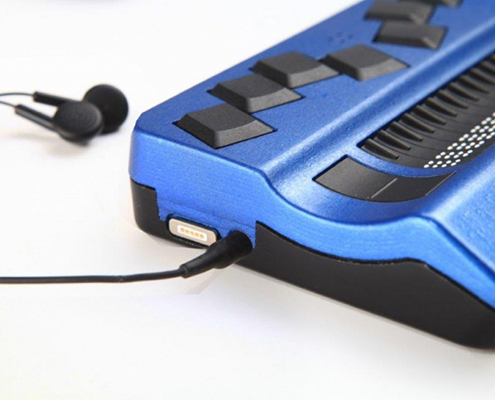 With wireless Bluetooth connection, the integrated headphone and microphone will let you stay in touch with the world. Up to four devices can be connected simultaneously to the Actilino: up to three Bluetooth devices and one USB. Additionally Actilino offers Bluetooth Audio. Get your Screen reader voice from the Actilino via the build in loudspeakers or discreetly with headphones. 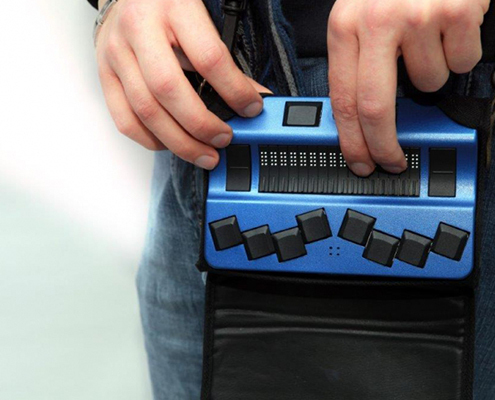 Actilino is both, a Braille display and note taker in one device. Thanks to the integrated HID-(human-interface-device) technology, Actilino will be automatically recognized by computer systems and will be working without the need to install a driver. 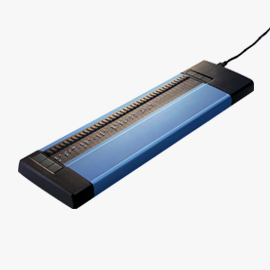 Window screen readers such as JAWS, Window-Eyes, NVDA or Supernova can be used with the Actilino, either wireless via Bluetooth or by a USB connection. Thanks to multi Bluetooth, Actilino can connect up to three devices at once. Compatible with Apple iOS, Android or Google OS. 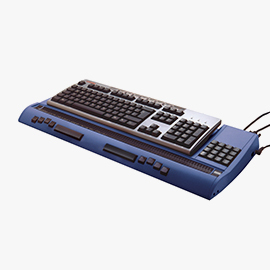 The Braille input keys are placed in that way that you can enter text in a convenient position: The control stick, located in the front center, can be comfortably reached with the thumbs. 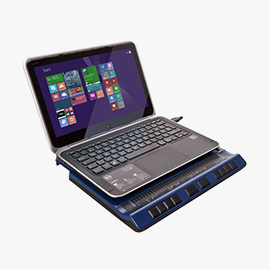 The detection of the reading position enables relaxed reading without the need to continuously press the scrolling keys. 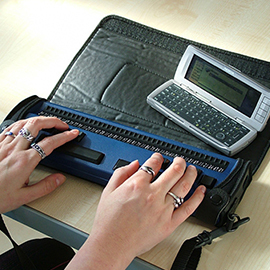 The unique concave Handy Tech Braille cells of Actilino allow reading Braille in a relaxed ergonomic reading position.